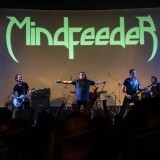 MINDFEEDER is a Heavy Power Metal band from Portugal. 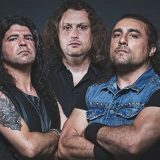 Mindfeeder are a Portuguese Heavy Power Metal band influenced by the Power Metal from the 90’s and 00’s but with a 21st Century approach and a warmth southern feeling presence in their songs. The Band was born in 2003 as Inertia, but then changed to Mindfeeder when they recorded their first demo “Rise from the flames” in the beginning of 2004. 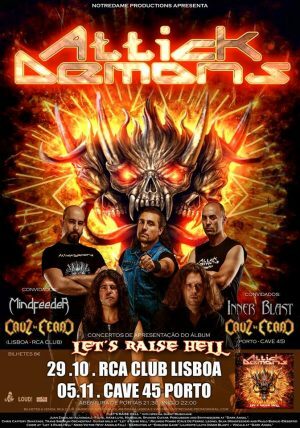 The song “The Traveler of Minds” taken from “Rise from the Flames” gave the band a 7th place in the 2005 Heavy Metal Eurovision Contest voted by Internauts. “The Traveler of Minds” it’s also the hymn to the Portuguese wrestling association that still nowadays plays whenever there’s a competition or a site highlight. In June 2006, Mindfeeder released the EP “Mind Revolution”, produced by well-known Portuguese producer Nuno A. de Loureiro and mastered by Mika Jussila at Finland’s Finnvox Studios. 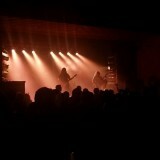 The track “Tear These Walls” taken from the EP would be selected to be on “Circulo de Fogo I Ataque” Metal compilation and remains as a crowd favorite. The EP would be very much acclaimed by Portuguese and international reviewers and the band would tour extensively (50 gigs and Festivals) until 2008. In the years 2008 and 2009 Mindfeeder are voted in the top 3 unsigned Portuguese Metal bands by the most famous Portuguese metal magazine LOUD! In 2012 the band started the recording of the first album at Mindfeeder’s Soundfeeder Studios. The Album was engineered and edited by Mindfeeder’s Keyboard player Ricardo Martins and mixed, Mastered and co-produced by Piet Sielck (Iron Savior) at Powerhouse studios in Hamburg. The debut album “Endless Storm” has the special collaboration of Mr. Sielck on Vocals and Solo Guitars and also Portuguese Metal Stars Hugo Soares (Iberia, Artworx, Ethereal), Artur Almeida (Attick Demons), Paulo Gonçalves (Shadowsphere) and Célia Ramos on occasional lead and Chorus vocals. The first album “Endless Storm” was released worldwide on 13rd January 2014 by Canadian Label Metalodic Records.